Eastenders producers announced that comedian and stage actor Richard Blackwood would be joining the Eastenders cast as part of it’s 30th anniversary but weren’t forthcoming about the character that he would be playing. 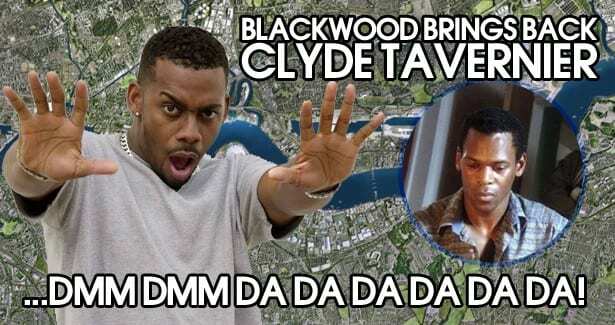 “Richard Blackwood has always been on our EastEnders wish list – and now the perfect part has come along,” said executive producer Dominic Treadwell-Collins. So who is this villain that Blackwood will be portraying? Could it be someone new or possibly old? My money is on someone old. He was the son of Celestine and Etta Tavernier and brother of Hattie Tavernier and Lloyd Tavernier. Clyde was suspected of the murder of Eddie Royle in 1991. In 1993 he left Walford to move to Trinidad, his ancestral home and has not been seen or heard from since. Until now that is. Could this also mean a return for Hattie?